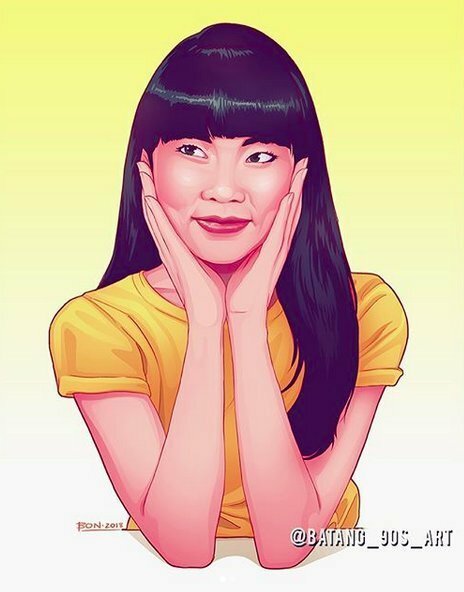 PENCILLERS: Hendry Prasetya, Bachan, Daniel Bayliss. Cover by Goni Montes. 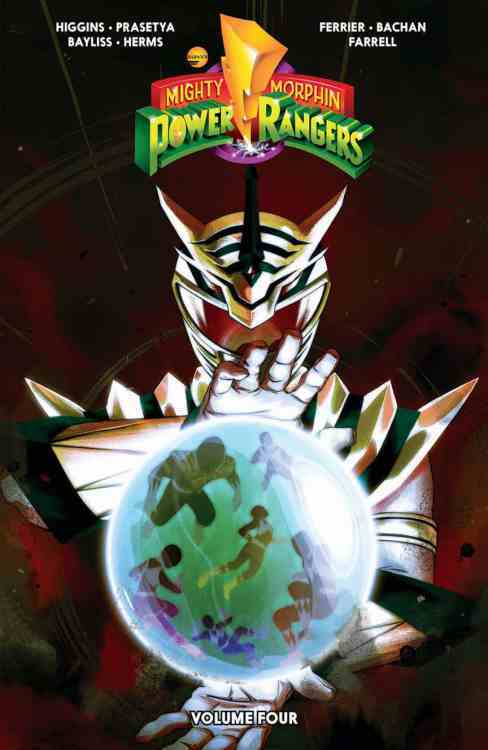 The first act in the larger story of Lord Drakkon comes to an end in Mighty Morphin Power Rangers, Vol. 4. 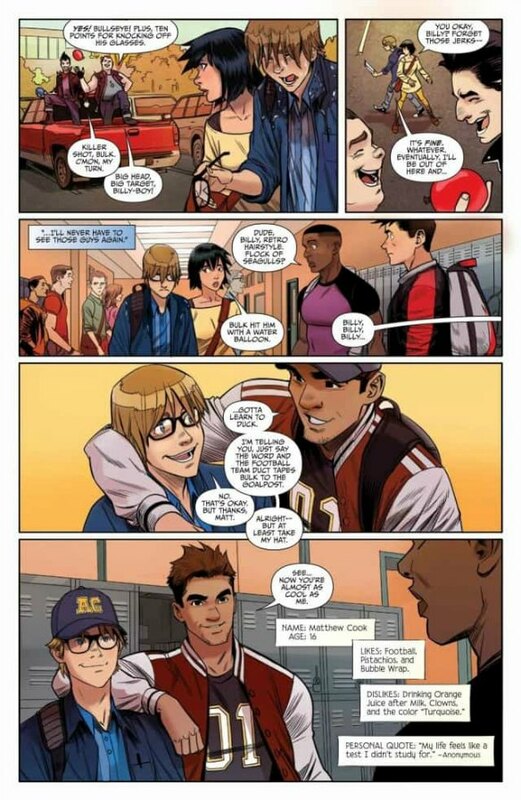 Tommy’s evil doppleganger looks great here, and we also get an awesome character spotlight. Overall, this MMPR series still has a big up side. But once we get into issue #16, particularly the last few pages, things start to get rocky. 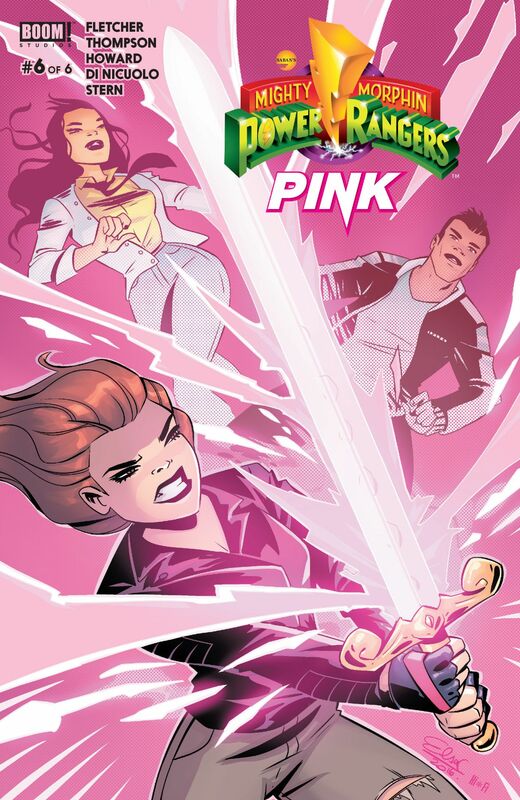 When we open the book, Tommy and Billy are still trapped in an alternate universe where the Green Ranger remained with Rita Repulsa after the events of “Green With Evil.” This turn of events led to the destruction of the Power Rangers, and Tommy’s rise as the evil Lord Drakkon. Now the Tommy and Billy that we know must join up with a resistance force (led by familiar faces) to bring Drakkon down. Meanwhile, Jason and the others face Rita and her minions with reduced powers, and without Zordon. And where is Zordon anyway? We get the answer to that last question in issue #15, and it’s the creative highlight of the book. Zordon has been absent for several issues at this point, so it’s obviously good to check in with him. But this issue goes above and beyond, following him into a rift between the dimensions. We see him meet his counterpart from Drakkon’s world, and how Zordon has continued to play a role in the conflict despite current predicament. More importantly, after witnessing how events have unfolded in this alternate reality, we see him speak from a place of uncertainty. We aren’t always shown that perspective from a wise old sage character like this. It’s an intriguing change up, which in the end cuts to the very heart of who Zordon is. Daniel Bayliss hits a home run with the pencils, inks, and colors. 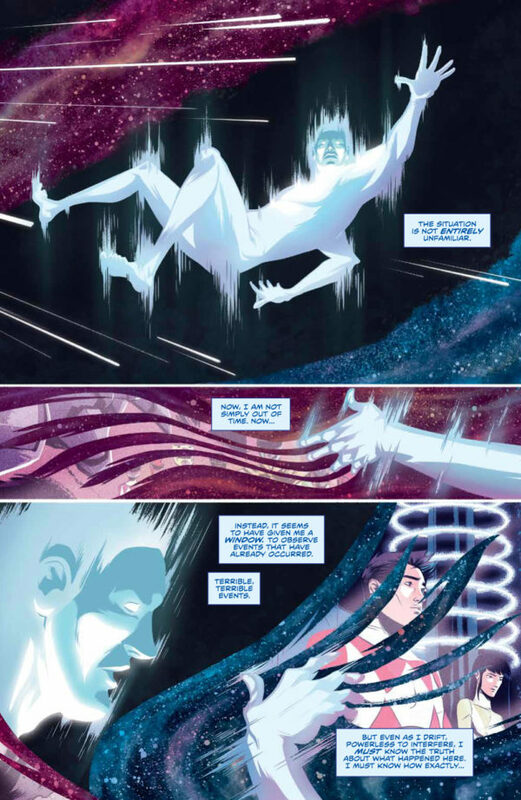 His renderings of a full-bodied Zordon interacting with the time warp around him, and later his other self, are compelling, gorgeous, and hit the mark emotionally. He also gets to play around with some of the the war sequences we’ve seen in previous issues. We get some familiar images of Rita’s forces in Washington, Drakkon holding the Red Ranger helmet, and a few glorious shots of the Thunderzords. Bayliss can’t come back to the Rangers soon enough. We closed the previous volume with the reveal of Trini, Bulk, and Aisha (who we know as the future Yellow Ranger) as members of the resistance. Having Aisha show up is a nice bit of fan service. But that’s all it amounts to. I won’t complain about that, considering how much griping I’ve already done about Tommy and Billy seeing things from their future. 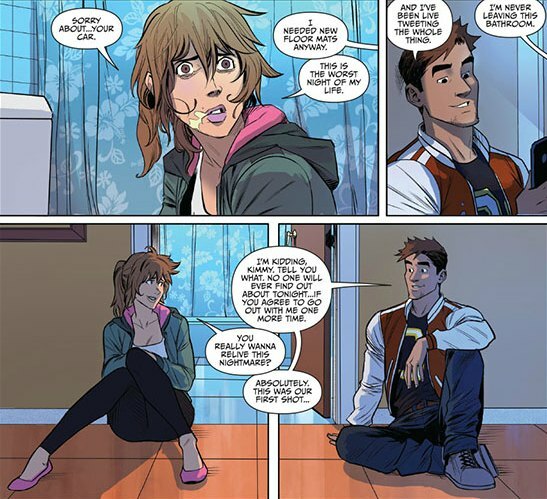 For whatever reason, this series is bound and determined to cast the fun-loving Zack as a brooder. We get more of that here. But it’s an alternate version of Zack, who has lost nearly everything and become the leader of the resistance. Given how dark the world around him has grown, I’m alright with this version of Zack being more dour. It even makes for a cool little moment with the canonical Zack toward the end. This volume also sees Finster create Goldar clones of all builds and sizes to fight against the Rangers. I love this idea. It makes sense. Goldar has failed Rita time and again, so she has Finster “improve” on him. This might have worked as an idea for the show, time and costumes permitting. We even get to see Goldar without his armor on the very first page. I didn’t even know he could take the armor off. 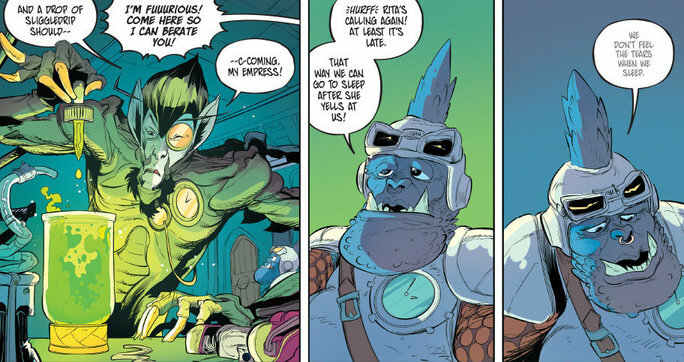 Kyle Higgins deserves a lot of the credit for the more sinister Finster we’ve gotten from the BOOM! books. The crowning example is what we got from Trey Moore and Frazer Irving in the 2017 annual. But the Finster we get in this book has a nice underlying creepiness to him. By comparison, the Finster we got on the show was almost a kind old man at times. One of the subplots we get in this book involves the Trini of Drakkon’s world coming to grips with seeing Billy, as the Billy of her world died saving her life. If Higgins and Hendry Prasetya are playing at an eventual Billy/Trini romance, they’re doing it in a very subtle manner. 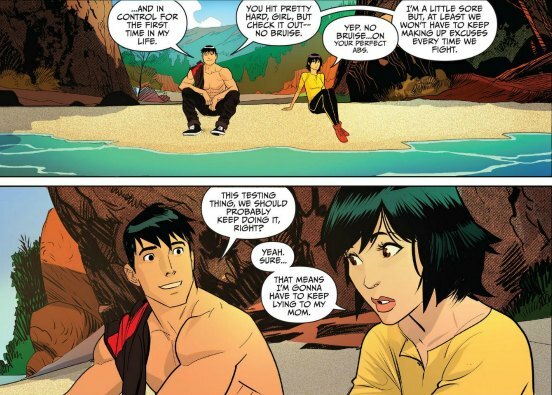 The potential romance between Billy and Trini thing is something some of us have been talking about since we were kids. They almost have to address it at some point. Even if it’s just an issue about how they don’t have those kind of feelings for each other. Matters aren’t helped when you consider Prasetya’s strengths are the super-powered action scenes, and not the quiet interpersonal stuff. So one can argue that material isn’t fully maximized. On the flip side, Prasetya’s fight sequences with a morphed Lord Drakkon are epic in the inevitable good Tommy vs. evil Tommy fight. This is obviously the first time we’ve gotten to see that costume in action. It’s very evocative of classic Power Rangers. The costume is obviously visually similar to the White Ranger suit. Darken is even holding Saba for much of the battle. You can easily hear Jason David Frank’s cheesy “evil” voice when reading some of Drakkon’s dialogue. (“Hello again, Tommy.”) There’s also a teamwork theme in effect here, which is something that’s remained present for the entire series. The Yellow Ranger also gets a Battlizer of sorts in issue #16. It comes out of nowhere, but looks cool enough. I also appreciate that it’s Trini who gets it. She was always the most underdeveloped character on the show, and remains that way in the comics. So this is a cool moment for her. At this point we’ve built this Lord Drakkon story up for four books. Everything has built to this confrontation between the two Tommys, and the Power Rangers finally striking back against Rita’s forces. The ending makes sense. But when I read issue #16 during it’s initial release, I was disappointed. We’d built to those big showdowns for so long, only for them to pass fairly quickly. This felt like it should have been a big, epic finale. The Megazord makes a big comeback against the Goldar clones, and Tommy and Drakkon make some kind of startling discovery about each other that leads into the next phase of the story. Instead the resolution, particularly the bit with the teens back at school, feels very rushed and slapped together. All the right ingredients are there. But we aren’t given enough time with them. Mighty Morphin Power Rangers, Vol. 4 has a few more problems than the previous volumes do. But all the elements that make the series great are still there. Namely, Higgins’ willingness to write an objectively silly concept in a more serious and dramatic voice, Hendry Prasetya’s awesome work on the words and costumes, and the added depth injected into the characters. 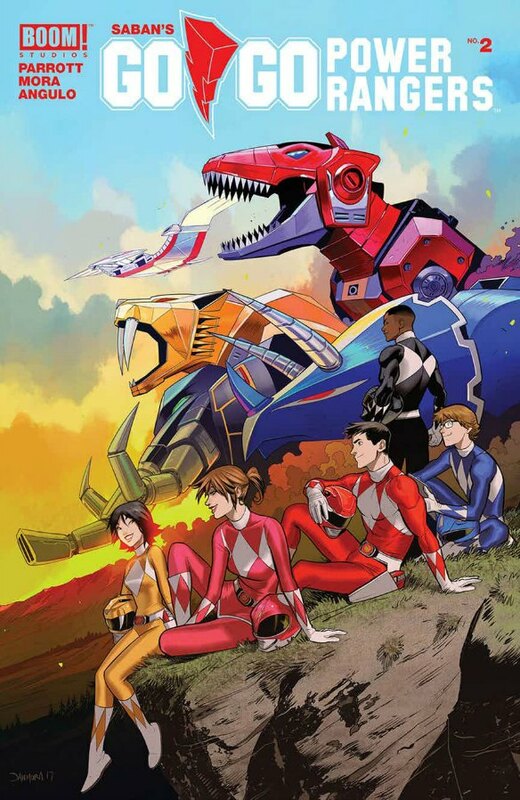 For Power Rangers fans young and old, this series remains a must-read. This entry was posted in Comic Books/Graphic Novels and tagged Aisha Campbell, Bachan, Billy Cranston, BOOM! Studios, Bulk & Skull, comic book reviews, Daniel Bayliss, Finster, Goldar, Goni Montes, Goni Montes Power Rangers, graphic novel reviews, graphic novels, Green Ranger, Lord Drakkon, Mighty Morphin Power Rangers, Mighty Morphin Power Rangers #13 (2017), Mighty Morphin Power Rangers #14 (2017), Mighty Morphin Power Rangers #15 (2017), Mighty Morphin Power Rangers #16 (2017), Mighty Morphin Power Rangers (BOOM! Studios), Power Rangers, Power Rangers comics, Rita Repulsa, Rob Siebert, Ryan Ferrier, Squatt and Baboo, superhero comics, teenage superheroes, Tommy Oliver, trade paperbacks, Trini Kwan, White Ranger, Yellow Ranger, Zordon on 11/04/2017 by primaryignition. PENCILLERS: Goni Montes, Dan Mora, Campbell, Frazer Irving, Da Jung Lee. Cover by Montes. I read a review not long ago, entitled: “You can’t force the things you loved as a kid to grow up with you.” It was in reference to the new Power Rangers movie. But the same idea can obviously apply to the Mighty Morphin Power Rangers series from BOOM! Studios. But perhaps certain things grow up better than others. 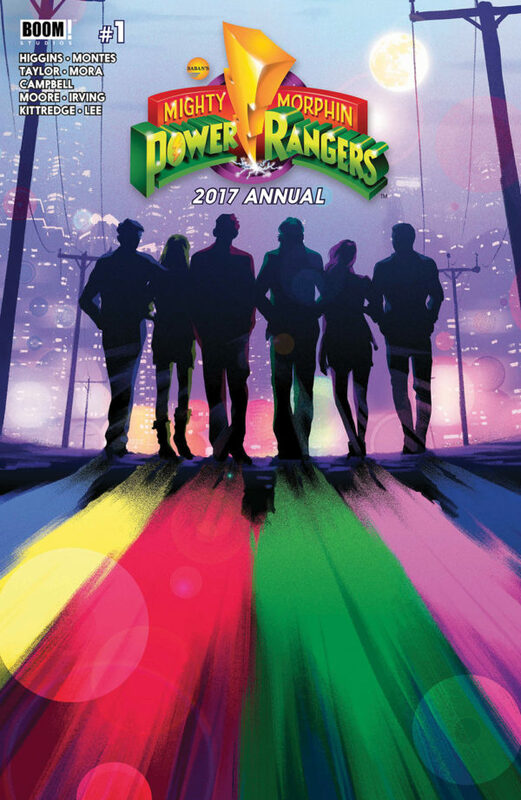 Last its predecessor last year, Mighty Morphin Power Rangers 2017 Annual contains several short stories. What stuck with me after I closed this issue was how relatively mature it felt. Certainly by Power Rangers standards. Mind you, as a ’90s kid I’m inevitably biased here. I make no bones about that. But I think what this annual highlights more than anything is that MMPR can indeed work when played straight as a teenage superhero book. And it can work in a number of ways. You can go the moody teen angst route. You can approach it like a young adult novel. You can even go flat out dark. There’s something to be said for looking at these characters and this world through different lenses. Especially when you’re trying to play to readers that grew up with the show. The BOOM! that way before. This story also makes Rita look delightfully cunning, manipulative, and that much more wicked. I didn’t recognize Goni Montes’ work at first. I’d never seen him work in this style before. Those amazing helmet variant covers for MMPR #1 are still plastered into my brain. I have yet to get tired of his work on this book. 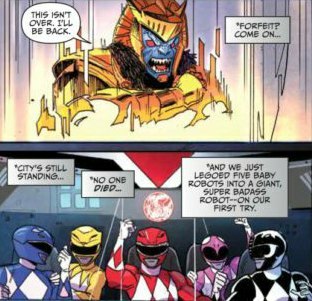 The next story, focused on the Yellow Ranger’s day off being interrupted by Goldar, is a preview of sorts for a second monthly MMPR title called Go Go Power Rangers. 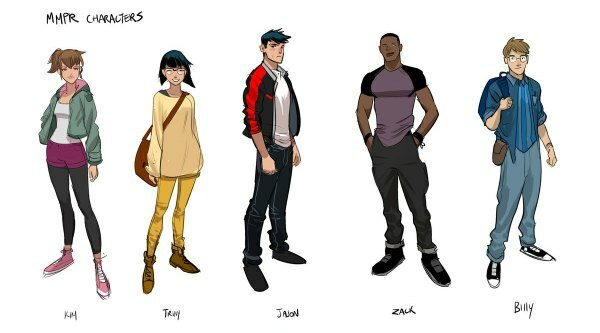 Series artist Dan Mora has a manga-influenced, animated style that should be a lot of fun. 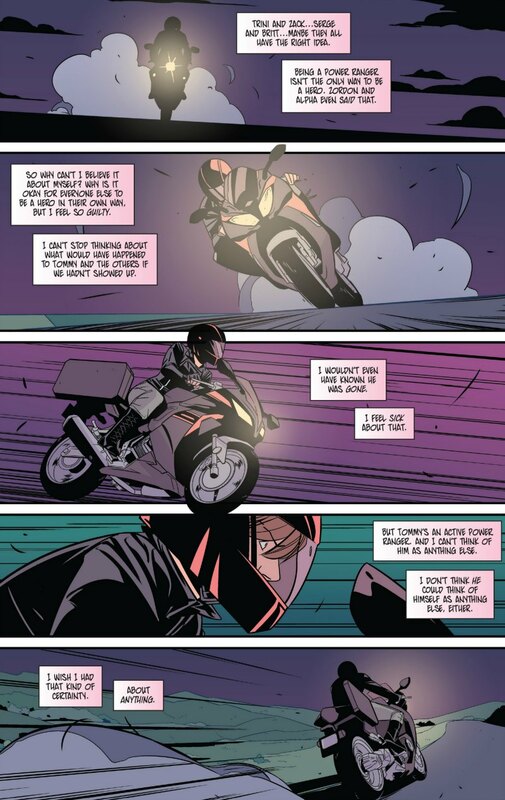 Author Tom Taylor (Injustice, All-New Wolverine) isn’t on Go Go Power Rangers, but he’s perfectly serviceable here. Much better than his work on Justice League/Mighty Morphin Power Rangers, that’s for sure. 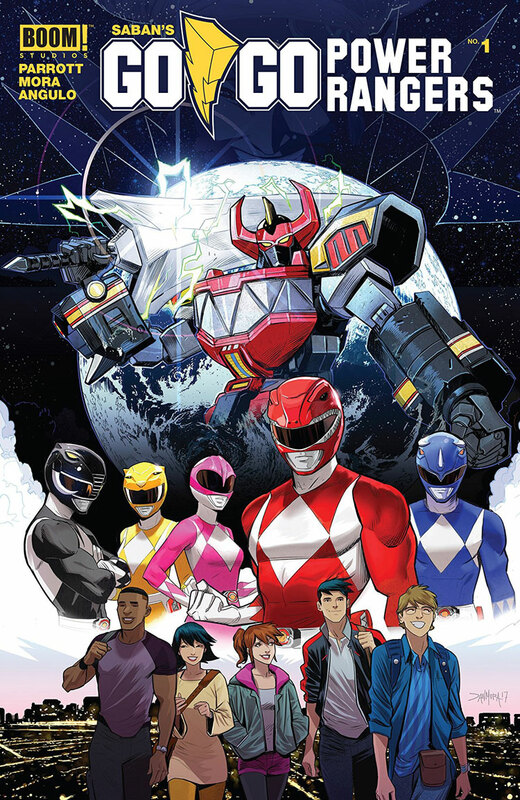 The clumsily titled “Forever Mighty Morpin Black” is next, written and illustrated by MMPR‘s regular cover artist Jamal Campbell. As both a continuity buff and a Power Rangers geek, this was a real treat. In the distant future, Adam Park, who succeeded Zack as the Black Ranger, returns to the ruins of the Command Center. He calls for help across time and space from other incarnations of the Black Ranger. What follows is a feast for the eyes, as variations of Zack and Adam arrive to fight off a monster. It’s essentially an Easter egg hunt for PR fans, as you spot all the little details and nods Campbell has sprinkled in. 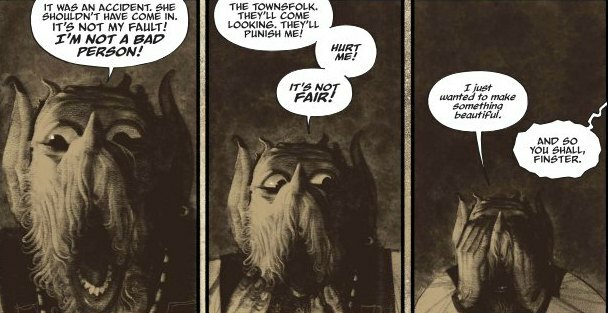 But having heaped all this praise upon this issue, it’s Trey Moore (Rachel Rising) and Frazer Irving that really steal the show. Seeing Irving doing PR is surreal to begin with. But in this context, it works. 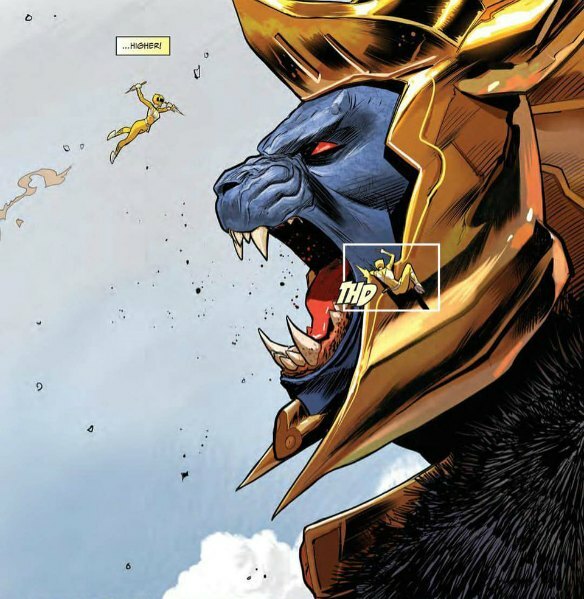 In last year’s annual, Moore gave us Goldar’s origin story. This year we get Finster’s. Moore and Irving give us what is essentially the first Power Rangers horror story. We see that at his core he’s an artist longing for inspiration, but he finds it and justifies it in the worst way imaginable. When he later is recruited by Rita to make monsters using a mystical, life-granting clay, he searches for vindication by attempting to resurrect someone he lost to his own selfishness. There’s a haunting quality to this story that’s brilliant. I’m hesitant to say much more, for fear of taunting the big pay-off. But these eight-pages are among the creative highlights of BOOM’s run with the PR license. It’s that good. If you’re an older fan, you owe it to yourself to check it out. My one nitpick with it? Finster’s line (shown above): “I’m not a bad person!” That struck me as awkward. It feels like it should have been “I’m not evil” or something. The issue ends with a more cartoony tale about Goldar and Scorpina getting a day off. It’s more akin to a Bulk and Skull story. Goldar is able to disguise himself with human clothes and a baseball cap. It’s a hard swerve to go from the Finster story to this one. But it’s fine. This kind of stuff obviously has it’s place. Heck, this material is arguably more faithful to the tone of the television show. 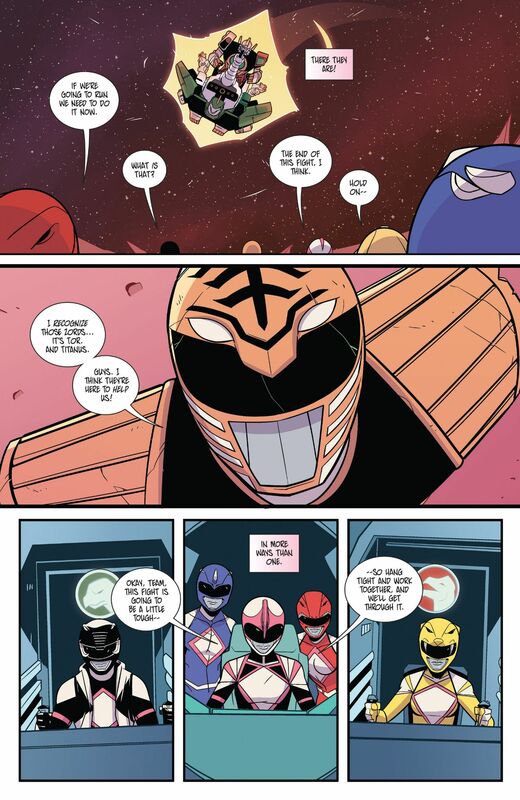 A year later, I still have really fond memories of last year’s MMPR Annual. I don’t doubt that a year from now, I’ll still have fond memories of this one. It’s no accident that we’ve gotten things like a spin-off miniseries, and a second series in Go Go Power Rangers. BOOM! is producing quality. Not just quality nostalgia, either. Pure and simple quality. This entry was posted in Comic Books/Graphic Novels and tagged Adam Park, Black Ranger, BOOM! Studios, Caitlin Kittredge, comic book reviews, comic books, Da Jung Lee, Dan Mora, Finster, Go Go Power Rangers, Goldar, Goni Montes, Goni Montes Power Rangers, Green Ranger, Jamal Campbell, Kyle Higgins, Lord Drakkon, Mighty Morphin Power Rangers, Mighty Morphin Power Rangers (BOOM! Studios), Red Ranger, Rita Repulsa, Rob Siebert, Scorpina, single issue reviews, Tom Taylor, Tommy Oliver, Trey Moore, Trini Kwan, Yellow Ranger, Zack Taylor on 06/05/2017 by primaryignition.